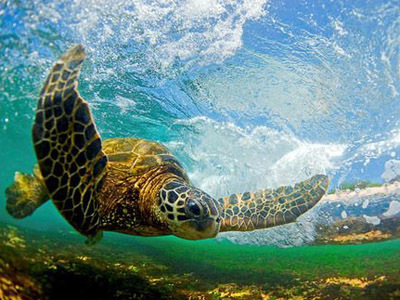 Experience together the wonder of two of Earth´s most charismatic marine species, gray whales and endangered sea turtles, all from the majestic setting of a sea turtle research camp in Magdalena Bay. This jewel of the Pacific, just a few hours between Loreto and La Paz, is home to a staggering number of marine and aviary species, lush mangrove canals and towering sand dunes. Your local hosts will treat you to the finest in regional cuisine with gourmet flair, and your naturalist guide will ensure you leave expertly informed on all themes of flora, fauna and local conservation efforts. Your feet will get wet on this participatory experience that lets you work alongside fishermen and conservationists in a project recognized as a model for community efforts to protect endangered species and habitat. 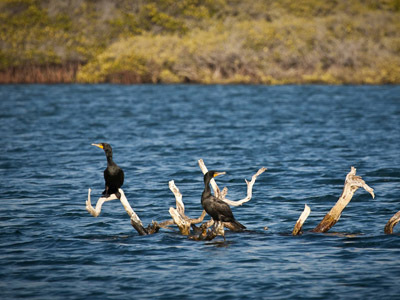 Depart from La Paz early in the morning en route to Magdalena Bay, jewel of the Pacific and home to a staggering number of migratory and marine birds, sea turtles, and marine mammals including the migratory gray whales. Stop for breakfast en route at one of our favorite local ranchos (not included). Settle into our secluded island camp and after happy hour, learn about the important sea turtle restoration project which will be the focus of tomorrow’s activities. Get a good night’s rest, tomorrow we search for turtles. Head down to the beach to finish measuring and weighing sea turtles before releasing them back into the wild, concluding the sea turtle monitoring portion of the trip. Today we explore the magic of the greater Magdalena Bay complex, it’s vast, rolling sand dunes and winding mangrove canals teeming with birdlife. Back at camp, budding chefs can head to the kitchen for regional cuisine cooking class. The rest of the group can head to the beach to learn artisanal fishing techniques, or relax and get lost in a book. Tonight we will learn about the gray whales, their incredible migration, and the importance of Magdalena Bay for breeding and calving to these magnificent creatures. Sit by the fire tonight and swap stories with your fisher guides and learn about the crucial role they play in conserving the natural resources of Magdalena Bay by combining tourism with conservation. 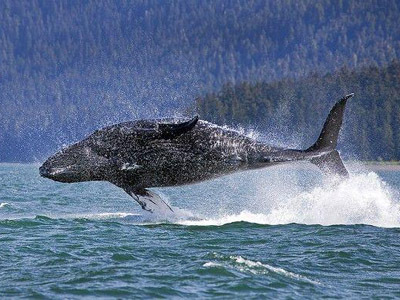 Bid farewell to your hosts and head out early to search for gray whales. We will depart by van for a short ride south before climbing about pangas that will take us out into the channel. Friendly whales often approach the boats, and the mothers are known to push the young calves closer, which can make for an incredible interaction between two species. We will enjoy a picnic lunch on a secluded barrier island before heading back out to see whales. Afterwards, we will head south to La Paz where the journey concludes. 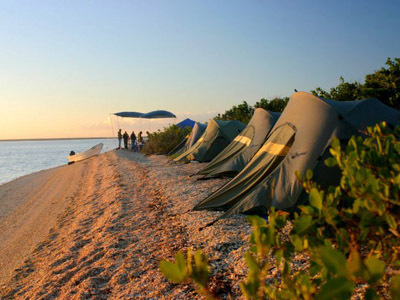 Camping along the remote shorelines of Magdalena Bay may not involve 300-thread-count sheets, marble floors, or even plumbing. But it is highly luxurious by back country standards, and it is a spectacular experience for anyone enthusiastic about the outdoors. 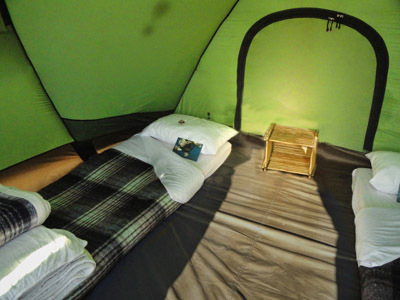 When you arrive, the roomy two-person tents are already set up, your bed is made, and on your pillow are two welcome gifts: a personalized card and a small trinket. Each guest gets a twin-sized, slightly firm but delightfully thick mattress with clean sheets, blankets, and a soft pillow. Between the mattresses is a broad aisle, and a small wood slatted nightstand, perfect for stashing an alarm clock (battery or solar-powered) and headlamp, and anything else you want handy during the night. The tents have zippered vents to provide air circulation during the heat of the day and a rain fly to keep out the wind and dew at night (the desert can get chilly after sundown). A bamboo mat serves as the “front porch,” a convenient place to remove and stash shoes. A small brush is provided for each tent to manage the sand that will inevitably get tracked inside. There are two large kitchen tents – out of which come healthy, delicious meals with local flair. The large, long dining tent is next door, and contains three wooden tables, plenty of plastic deck chairs, a cooler with purified water, and a bookshelf featuring tomes on plant, bird and animal identification, Spanish language, and other useful topics. The walls of the dining tent can be tied back to catch a breeze during the day, or closed to block the wind at night. There are also two outhouses, camp sinks and a tall, 3-walled enclosure which houses the camp “shower.” Sun-warmed water awaits in metal containers and a rubberized mat with drainage holes prevents sand accumulation on your wet feet as you wash off. This is just one of many authentic travel experiences offered by Global Basecamps. If you are interested in more unique destinations to Mexico with unprecedented planning and extraordinary service visit our main Mexico tours page to browse other sample trips.